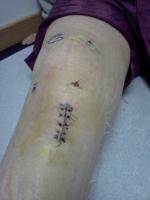 Hi, I am now 4 months post op after having an ACL Hamstring reconstruction (23 April 2008). The original injury was done playing football back in 1992. I was wrongly diagnosed, as I was told I hadn’t torn the ACL, I spent 6 months training hard in the gym only for it to give way within 5 minutes of playing football again! I got referred to a London Hospital and had an MRI scan which confirmed a complete tear of the ACL. I had an arthroscopy, which I was under the impression was to repair the ACL but after the operation I was told I would need full "open knee" surgery if I wanted to get back to playing football. Unfortunately I had just started a new job and we had bought a house, so I couldn’t afford to take the time off to recover. I have avoided playing football since then but I’ve still suffered with the knee giving way on me, sometimes with things as simple as walking down the stairs, or getting off a train. It got to the point where I needed to get something done. I was initially told by my GP that because of the amount of time since the original injury it wasn’t possible to repair the ACL. I was obviously upset at this, but I decided I would call the surgeon who had done my original arthroscopy and he was very annoyed that I’d been wrongly informed. I was then told I could have the surgery and things had moved on and the recovery time was now much shorter. Things are going well, I have had my 3 month strength test and it came out at as 80% strength of my unaffected leg which was really positive. Unfortunately I’ve had a few set backs where I have torn the hamstring. The first incident was a matter of weeks after the op, the pain was excruciating. The pain was on the inside of my knee (which I now learn from your website is where the graft was taken from). went out jogging (about a mile) for three nights in a row without any problems but on the fourth night I pulled / tore my hamstring (not in the same place as before, higher up but still on the inside of my leg). I presume, due to these subsequent injuries or maybe there would have been some anyway, but I found myself with a large amount of scar tissue on the hamstring. This was particularly noticeable when I tensed my knee. I decided at this point in addition to my hospital physio sessions I would attend a sports physiotherapist to try to reduce the amount of scar tissue and hopefully improve the strength / elasticity of the hamstring. This has been going very well and I am now doing light gym work with regular checks to ensure things are progressing normally. I am still experiencing pain when straightening my knee, again this pain is mainly located on the inside of my knee but it also seems to be painful pretty much all around the knee. My physio has done the “drawer” test and confirmed that the ACL is strong, he thinks that I may have torn/damaged the MCL as when he holds my thigh and puts inward pressure on my lower leg I do feel some pain (as he applies pressure it makes me flinch – this is very difficult to explain in writing!) but he isn’t 100% sure as to the cause of the pain. I don’t feel that I have done anything vigorous enough since the operation to have damaged the MCL? The best way I can explain how much knee feels at this stage is “heavy”, I’m not confident in the knee when turning (this is whilst walking not running) and so I’m starting to get a bit despondent. My question (finally I get to the question!) Is this normal to experience this pain after four months? And would you say that the “heaviness” and lack of confidence is normal? I only ask as my physio, both at the hospital and the gym aren’t able to say. I know everyone is different and their recovery times will vary but any advice / help would be really welcome.